With your support, our students can meet people’s needs. Has your life been touched by a social worker? Does your child have an amazing pre-school teacher? Know a family that has overcome adversity with the help of a therapist? Is access to food, nutrition, and health care something you’re grateful for? Have sports made your community stronger? When you support Falk College, you support world-changers. Falk College students and alumni make a difference in our communities through careers in nutrition and food, social work and family therapy, public health, human development, and sport management. Your gift will do more than give current students learning opportunities in the classroom, in the community, and around the globe—it will help prepare them to do some of the world’s most meaningful work as alumni. You decide how your gift will make a difference. Your gift gives students every chance to succeed: from scholarships and immersion trips, to learning laboratories and internship opportunities. Through these kinds of classroom learning and hands-on experiences, our students become professionals who enrich the emotional and physical well-being of individuals, families, and communities. You can direct your gift to the Dean’s fund or to the specific academic program that means the most to you. Each academic department has its own discretionary fund, which provides students with immersion trips, experiential learning, and internship opportunities, the cornerstone of Falk College’s theory-to-practice teaching approach. Discretionary fund donations also help bring accomplished and prominent guest speakers to campus to share their industry insights with Falk students. The discretionary funds have supported students who would benefit from attending or presenting at prestigious conferences across the country and abroad. Meet the alumni who have built our legacy since 1917. Falk College at Syracuse University shares in a legacy that spans a century. The Colleges and Schools that came before us, including Home Economics, Human Development, Human Services and Health Professions, Human Ecology, Nursing, and the School of Social Work, have instilled in us the values of human connection, civic service, and social justice that guide the College today. Let our students share how your gift helps the story continue. 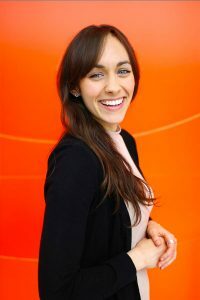 As a Falk College student majoring in human development and family science (HDFS), formerly child and family studies, Syracuse University has given me opportunities to learn, grow, and explore my career interests in incredibly meaningful ways. I am fortunate to have served on campus and in the community as a tutor to Southeast Asian refugee students, a teacher’s assistant in general and special education elementary classrooms, and as a peer partner at the Lawrence B. Taishoff Center for Inclusive Higher Education. 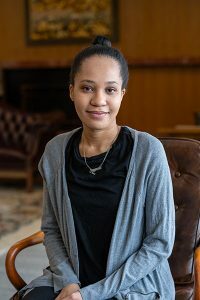 Through the McNair Scholars Program, which provides underrepresented students with resources to pursue graduate education, I completed a preliminary research project on the identity development of transracial adoptees—a project I hope to continue in my graduate studies. I was humbled to be acknowledged for my dedication and aspirations to improving the lives of children and families when I was awarded the Ruth Tolley Award by the Women of the University Community at Syracuse University. This award, along with other gifts and grants, made it possible for me to make the most of every opportunity here. 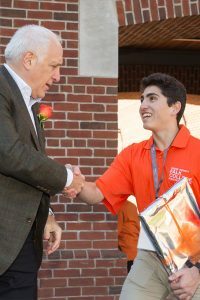 A gift to Falk College provides students like me with new experiences that foster our personal and professional development and grow us as leaders on campus and in the broader community. But did you know your gift does even more? The dedication my fellow students and I have to improving the lives of others is unmatched. Because of the professions Falk students pursue, your support also impacts the families and communities we will serve well into our careers—enabling us to make great strides in society, together. On behalf of the students at Falk, thank you. Your support means so much. 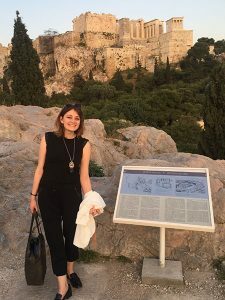 When I began the master of social work (MSW) program at Syracuse University, I wanted to explore working with an organization abroad to bridge my experience counseling refugee students with policy action research. While it is not typical for MSW students to spend an entire semester abroad, Professor Nancy Mudrick, along with the School of Social Work and Syracuse University Abroad, helped me fulfill my graduation requirements, including a semester-long field placement. Something wonderfully unexpected happened through this internship, thanks to support from the Falk College Dean’s Fund. As a graduate trainee with the Council of Europe’s Pompidou Group in Strasbourg, France, I immersed myself in studying the challenges Mediterranean countries face with refugees, substance use, drug networks, and coercion. I was invited to present my research at the International Conference on Refugees and Drugs in Athens, Greece. With support from the Falk College Dean’s Fund, I travelled to the conference, spoke about current research on this topic, and facilitated a workshop. It was the experience of a lifetime! Working in an office with colleagues from France, Germany, Greece, Hungary and other European countries strengthened my ability to think cross-culturally. Every day was a new opportunity to discuss human rights issues through various backgrounds. This internship ultimately left me feeling more committed to making a social impact in the country I call home. 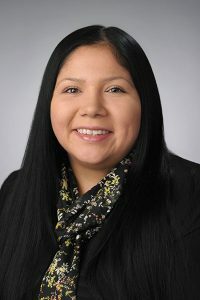 I have since relocated to the Chicago area where, as an evaluation specialist, I lead culturally responsive program evaluations, facilitate community trainings, and manage projects that help organizations bring community to the center of their work. My global study abroad experience helped me develop a critical skillset for the work I do today. I am forever grateful that generous donors of Falk College helped open doors to me that I never imagined possible. It’s one thing to receive financial aid through FAFSA or NYS TAP, but earning it is different. As a nutrition major with a minor in marketing, I work alongside Chef Mary Kiernan and diligent nutrition students twice each week through the Susan R. Klenk Assistantship. Together, we think critically, create intentionally, and try repeatedly, perfecting our professional competencies in Falk College’s amazing hands-on culinary facilities. Over the years, Ms. Klenk asked Chef Kiernan, “what do you need?”, and that is how the Susan R. Klenk Café and Teaching Kitchens and the Klenk Learning Assistantship came about. I often ask a similar question to my students, which always leads to curiosity, experimentation, and discovery. These experiences are difficult to attain simply by looking at lecture slides or jotting down notes. I have such gratitude for Susan Klenk as her support gives me a chance to discover new leadership qualities in myself, working side by side with a lively, insightful, unparalleled mentor—Mary Kiernan—while helping other students expand their minds beyond traditional classroom learning. If you haven’t already made a gift, I’d ask you to think about doing so today. Your support of any amount will impact nutrition students. As we both know from experience, putting what we’ve learned in class to practical use is valuable as a student and beyond. Thank you for your support. Before I had the privilege of going on the “Roots of American Social Work” immersion trip to New York City, I knew I wanted to accomplish great things with my social work career, but I wasn’t sure just how. There are so many places that need social workers—but where was the place for me? I left for the immersion trip thrilled for the once in a lifetime opportunity, but I never imagined I would discover the answer there in New York City. As I visited the agencies spearheading contemporary practice and met with inspiring professionals doing transformative work in their communities, it not only fortified my confidence in my professional ambitions, but it gave me the critical understanding I needed to define where exactly I wanted to take my career: to the hospital setting. I vividly recall visiting one agency in particular, Mount Sinai Health System, where I witnessed such a strong connection between colleagues working together to effectively deliver much needed care to patients. It opened my eyes to the hospital environment and made me realize it was a place I could see myself thriving. The experience was truly formative in my career, giving me insight that could only be attained by seeing the environment first-hand. The immersion trip gave me hope for the future and the things I would like to accomplish. It is something I will take with me for the rest of my career, and I have our generous donors to thank. As a College Ambassador, I help prospective students and families through the Falk Admissions Office. I also play a role in Falk special events, including its Dedication Ceremony in October 2015 where I met Brandon Steiner (pictured here), Founder and Chairman of Steiner Sports Marketing who serves as Chair of the Sport Management Advisory Board. The summer following my freshman year, I had the privilege to intern in the Sports Partnerships Division of the U.S. Fund for UNICEF in New York City. The internship exposed me to so many valuable lessons through direct, hands-on experiences, from building and maintaining relationships within an organization to mastering the fundamental strategic steps that go into forming sports partnerships. This sort of partnership building is exactly what I envision for my future career, so having the chance to hold this internship position early on was invaluable. Because my family lives in Houston, it was difficult for me to imagine how I would afford the living and travel expenses of an out-of-state summer internship—at least not without filing for another student loan. I received the Sport Management Summer Internship Scholarship, created by the parents of a senior sport management student. Scholarships like this one and other financial support many of my classmates have received because of generous donors take a crucial financial burden away from all of us. For some students, they are only able to take full advantage of field trips, internships, and immersion programs because of donor support. Since moving into the new Falk Complex my freshman year where I take the majority of my classes, I have witnessed how donor generosity transforms the opportunities we have in class—and ultimately will have in the field as sport management professionals. I currently have a sport analytics course in the SPM Technology Lab, made possible by the generosity of the parents of a junior sport management student. I am certain the real-world setup in this lab is giving me an edge over students at other universities that will benefit me in the job market. Whether your interest is in supporting field trips, professional conferences, student competitions, national and international internships, or study abroad opportunities specific to the sport industry, I am hopeful you will consider making a gift. Or maybe you have another idea about how you’d like your gift to make a difference for students. Be assured every gift helps support students like myself. Thank you for your support and for making good things happen for sport management students at Falk College. 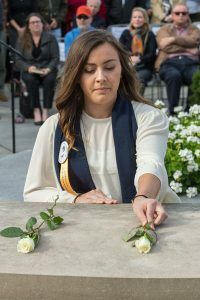 Kelsey Montondo ’18, Falk College Remembrance Scholar, at the annual Rose-Laying Ceremony that honors the 270 people, including 35 students studying abroad through Syracuse University, who were killed in the December 21, 1988 bombing of Pan Am Flight 103 over Lockerbie, Scotland. The ceremony also honors 2002-03 Lockerbie Scholar Andrew McClune, who died in 2002. Growing up in a single-parent home with my mom and my sister, my grandfather was a special father figure. The day my grandfather was diagnosed with Parkinson’s disease was a dark one. Darker still was the day he passed away. But sometimes it’s our darkest days that make us who we are, because the journey between those two days is what inspired me to pursue a career in clinical health. That’s why I am here, majoring in public health at Syracuse University’s Falk College. This fall, I was incredibly humbled to be named a Remembrance Scholar. These scholarships, given to 35 Syracuse seniors each year, honor the 35 Syracuse students who lost their lives in the 1988 bombing of Pan Am Flight 103, alongside 235 others. During Remembrance Week, October 22-28, I had the privilege to take part in a number of activities that encourage our campus community to “Look Back, Act Forward”: our motto. I was profoundly and forever moved to meet the families of the victims, honor the beautiful individuals who we lost that day, and celebrate that something so terrible, intended to divide us, has created such beautiful unity. I am so very grateful for this scholarship and for the generosity of donors whose financial gifts opened the door to this life-changing opportunity. In Falk College, I am surrounded by people who are like-minded and want to make a difference in the lives of others through careers in public health, food and nutrition, social work, marriage and family therapy, and human development and family science. A gift to Falk College supports the health of our future by training professionals who are ready to meet the critical needs of individuals, families, communities, and the world. you have in our success. Current Falk College seniors who wish to participate in senior giving should make their gift through Class Act.